OWATONNA - Southern Minnesota Initiative Foundation’s (SMIF) AmeriCorps LEAP (Learning Early Achieves Potential) Initiative was selected to receive continued funding to host 20 FTE AmeriCorps positions focused on school readiness in the nationally competitive 3-year grant round. SMIF's program is one of 13 in ServeMinnesota's portfolio of programs. Senator Al Franken, a strong advocate of the AmeriCorps program, also spoke at the awards announcements. “AmeriCorps members develop important skills for a lifetime. They also prove to be better workers and citizens in society,” said Senator Franken. He highlighted that for every dollar spent on AmeriCorps members, there is a return of $3.95 back into our communities. Since the program's founding in 1994, 900,000 individuals have served in AmeriCorps across the US while tackling pressing problems and mobilizing millions of volunteers for the organizations they serve. 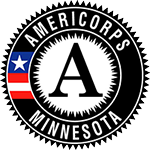 Over the past 20 years, 25,000 Minnesota residents have served 38 million hours through AmeriCorps. The state was awarded $33.6 million for the program this year, which will be matched with $26.8 million at the local level. SMIF has served as legal host for AmeriCorps since the inception of the program. To learn more about SMIF’s AmeriCorps LEAP Initiative, contact Barbara Gunderson at barbarag@smifoundation.org or 507-455-3215, or visit our website at www.smifoundation.org. The LEAP Initiative is an AmeriCorps program made possible through the Southern Minnesota Initiative Foundation-Early Childhood Development partnership with ServeMinnesota, and the Corporation for National and Community Service. We are committed to recruiting and engaging individuals without regard to disability, gender, race, religion or sexual orientation. Reasonable accommodations provided upon request.